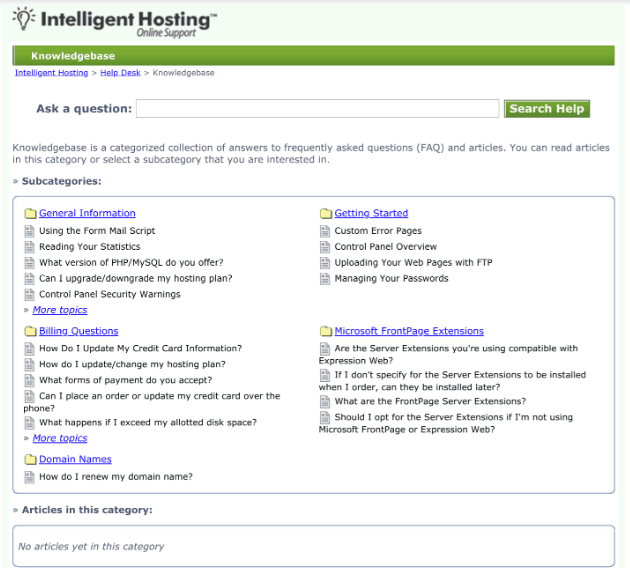 Intelligent Hosting Review 2019: Is Intelligent Hosting a Good Hosting? Long-established (or simply old-fashioned) host Intelligent Hosting provides shared hosting plans with a 99.95% uptime guarantee. Its plans are expensive, but you get most of the features you need plus a few surprising extras. Intelligent Hosting sells small business website hosting. Judging from the copyright notice on its simple “old school” English-language website, it has been in business since 1999. The servers use robust Intel Xeon processors, with SCSI hard drives and RAID to prevent data loss in the event of a hard drive failure. The servers are housed in what Intelligent Hosting calls a “Class A data center” with five backup generators and N + 1 controls. I can’t tell you what “Class A” means in terms of data center tiers, but I can tell you that there is an above-average 99.95% uptime guarantee. The list of value-added features is not endless, but there is most of what most of you will need: support for PHP (only version 4), Perl, MySQL databases, phpMyAdmin, and SSI. For SSH access, you would need to upgrade to a VPS or dedicated server plan. As well as the standard features, Intelligent Hosting also offers a few unusual – and frankly a little bit retro – features such as free SEO tools including a search engine submitter and a search engine rank reporting tool. And who really uses a guestbook these days that allows your visitors to leave their name, location, and a message on your website? This provider’s hosting plans come with relatively low resource allocations, so it’s hard to understand the premium prices unless the price-to-feature ratio has not changed since this company was founded in the early days of the internet. To get a price anything like what you would want to pay, you would need to commit to a two-year plan, with the small consolation that the 30-day money-back guarantee should get you out if it all goes wrong. The plans are provided on one, six, twelve, and twenty-four-month terms, with a decent discount for the longer terms. You’ll need to purchase a .com, .net, or .org domain name with all plans, and SSL certificates cost extra. Technical support is substandard by today’s standards. There is no telephone number, no email address, and no live chat. You can contact the company only by submitting a ticket and hoping that it gets answered. My test ticket submission resulted in an automated email to say that the support team should respond within 24 hours. There was no subsequent response. There is a superficially satisfactory knowledge base for self-support, but it seems to have stopped evolving in 2011. Owned by parent company intelligentwebsites.com, this vendor might not be an intelligent choice of hosting provider. 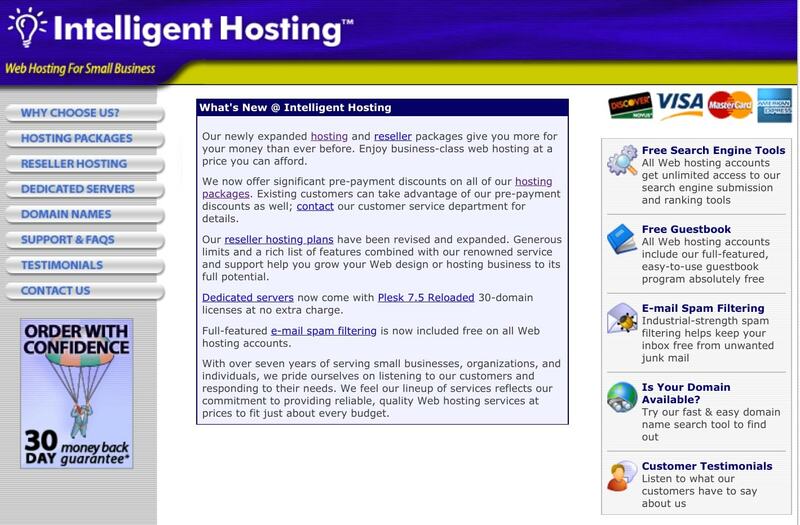 At best it seems to be stuck in the past, and at worst is no longer operating, which is a shame because Intelligent Hosting was probably a very intelligent choice back in the day. Interested in old-fashioned hosting? Check out Intelligent Hosting. Wondering how Intelligent Hosting stacks up against other Web Hosting companies? Enter any other Web Hosting company and we will give you a side-by-side comparison.